Our Drummer Boy, Clarence McKenzie. Today is Memorial Day, a term first used in 1882. The day is set aside to remember those who died serving in the Armed Services of the United States; the day’s name officially became Federal law in 1967. Let us remember one of the youngest who lost his life. Clarence McKenzie’s grave marker watches over those of other Civil War soldiers. On July 9th, 1860 an 11-year-old boy from Brooklyn named Clarence McKenzie joined the 13th Regiment of the New York State Militia as a drummer boy. Clarence was a member of the band that played for an evening reception that was held at the Academy of Music to welcome Great Britain’s Albert, Prince of Wales on the 12th of October 1860. Along with waltzes, polkas and quadrilles, the band played God Save the Queen (the Prince’s mother) as His Royal Highness entered the ballroom. Some boys were trained how to drum before they were sent off to war; but many others learned on the job. Click here for the 2014 entry about Memorial Day and Green-Wood Cemetery photos. In June 1861 Clarence’s unit rode a steamer to Annapolis, Maryland; but before he saw action on the battlefield, he was shot when the musket of member of his own regiment accidentally discharged. He was killed by “friendly fire.” He was 12 years old and the first Brooklyn resident to die in the Civil War. 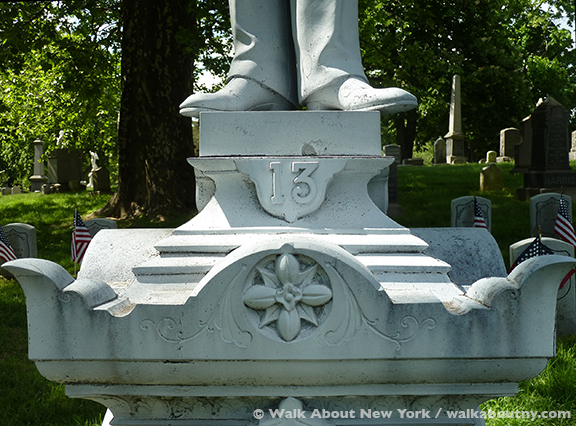 His funeral was held on July 14, 1861, and 3,000 people attended his funeral; the Brooklyn Daily Eagle called him “Brooklyn’s Boy Martyr.” He was the first Civil War casualty to be buried in Green-Wood Cemetery, a National Historic Landmark since 2006. There are 8,000 Civil War dead in Green-Wood Cemetery. Clarence McKenzie’s burial came three months after the Union troops at Fort Sumter surrendered to Confederate forces. Twelve days later, Drummer McKenzie would be joined at Green-Wood by Brooklyn’s first Civil War battle casualty, Private Adolph Vincens (1839–1861). The 23-year-old, London-born jeweler, who worked at the fine Broadway jewelry store, Ball, Black & Co., fell at the Battle of Great Bethel, near Hampton, Virginia. The detailing on the figure and drum is strong. The Civil War was a major rallying point for citizens, in the North and South. Children were not blasé about the excitement that gripped the country’s two regions; they very much wanted to be part of the excitement of the war. They helped their mothers roll bandages; they wrote letters to friends and family members fighting in the war; and boys could join the army as drummers or as fifers. Clarence McKenzie’s grave marker is the most distinctive of any Civil War grave. Able-bodied adult males were required on the battlefield; therefore the job of drummer often went to boys, some as young as eight-years old. Unlike the drummers in today’s army, Civil War drummers were an integral part of the war machine. The figure’s hollow eyes stare into an infinite space. A drummer established communication amongst the ranks and kept order in the field; without him many campaigns would have failed. The drummer used different drum calls for a variety of goals, from assembling officers for strategy meetings to sounding retreat in the midst of severe enemy fire. A drummer was stationed near a high-ranking officer; at a moment’s notice he might be needed to alert the troops to an upcoming change of plans. During troop movement, the sound of the drum was meant to take the soldiers’ minds off the monotonous task of long-distance marching. Some markers are modern-day ones, supplied by the Department of Defense. Before the actual battle began, it wasn’t unusual for the fife and drum corps to march out in front of the regiment and play a tune to intimidate the enemy before they joined their companies. The monument is made of zinc. The monument that marks Clarence’s grave in Green-Wood Cemetery is quite striking, and has been kept in good repair. Its dominant feature is a drummer boy, with his drum and sticks in hand ready to do his duty. Brooklyn’s Drummer Boy has not been forgotten by the wider Brooklyn community; P.S. 230 in Brooklyn’s Kensington section was renamed the Clarence D. McKenzie School in March 2008. The graveside flags are put in place by volunteers. Bridgeport, Connecticut’s Monumental Bronze Company produced cemetery markers and monuments made from zinc, sometimes called “white bronze.” These were available in a variety of sizes and styles, including figures such as the one produced for and in the likeness of Clarence Mackenzie. The figure can look life-like enough to begin drumming. By the time the war ended in 1865, about 200 other Civil War soldiers and sailors fatalities were buried at Green-Wood, which was established in 1838 on what had been Brooklyn countryside. In the decades after the war thousands of others would join their comrades, as well as some of their one-time enemies, at the historic cemetery. Today, the cemetery’s rolling hills, covering 478-acres of greenery and statuary, is the final resting place of 8,000 Civil War veterans. Clarence McKenzie’s original, rounded grave marker can be seen beneath the flag. The monument is decorated with symbolism. The corners display artillery cannons pointed downward, a military interpretation of the traditional downward pointing torches sometimes seen on mausoleums or funeral monuments. One panel shows the flag ribbon and star of the Grand Army of the Republic. The number “13” that is centered below his feet is for the regiment in which he served. “13” is for his regiment. Twenty-five years after his death, Clarence McKenzie got a grave marker.